It sounds like a joke, but who knows. It's exclusive to UK's based Game store, but priced in US currency...so take that as you will. Deep Silver has announced that Volition's Saints Row IV has managed to shift over 1 million copies during the game's first week on sale, with the publisher deeming the manic open-world title "a smashing commercial success." In fact Saints Row IV is "also leading the charts in almost all major European countries in the first week of its sale. The game has already garnered the top spot in the UK, Germany and Benelux (on all platforms)," according to Deep Silver. "We are incredibly happy with the reception for Saints Row IV as a critical and now a commercial success," said Klemens Kundratitz, CEO of Deep Silver's parent company Koch Media. "The development team at Volition is second-to-none as a driving creative force in the entertainment industry and we are very proud to have them as part of the Deep Silver family." 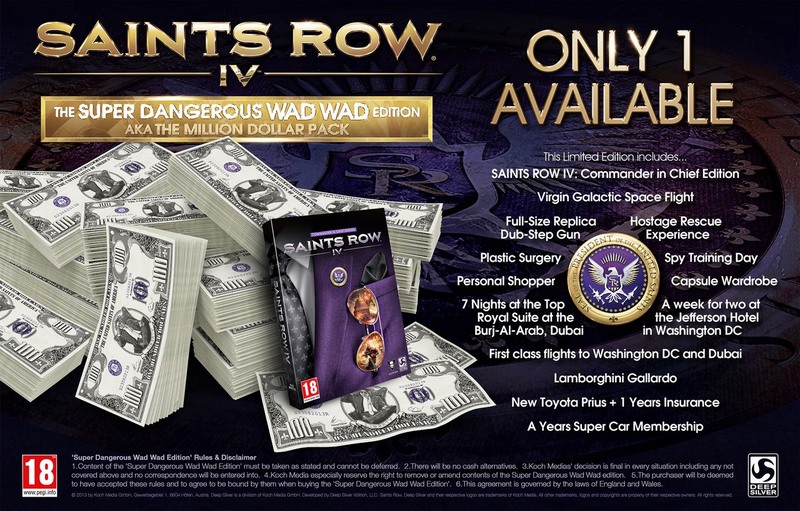 Saints Row IV launched in North America on August 20th and August 23rd in Europe. *Note: This is actually running on a PC Mod - but since this is there's no running SRIV PC thread, I figured it would fit best here.